HOTEL WAIKIKI: "They Talk About Me Like a Dog." I'll be waiting, because I didn't read the whole article and I wasn't sure what he means by that. Does he mean a bad dog? A good watchdog? A funny dog? A dog to kick around? Kay- Obama was calling a spade a spade in the non-conventional sense that only a President that superseded racial barriers would be able to pull off. Pure genius! Cloudia- Oh, yeah, and with an exclamation mark. He looks kinda pissed off in that photo. Brad- he was on his game. 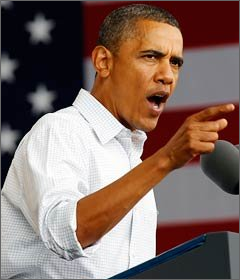 Fantastic orator, plus remember, as a lawyer, Obama's well polished in arguing his point before a jury. owner- dogs don't talk, dog's speak. Chest growl.